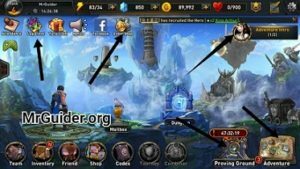 Nexon Company has just released a brand new RPG for mobile devices on Google Play Store. In this game, the player builds a team of 5 best characters and battle against monsters and enemies in various game modes. Returners game features amazing characters and tactic cards, lots of game modes, challenging levels & boss fights, and much more. In this post, we have covered everything about the game; Returners guide and Returners tips, cheats & strategy to build the best team of characters. The Basic -> In Returners game, your main objective is to build the best team of heroes to slay down the monsters and opponents. Initially, it is very easy to win the battles. As you progress, it becomes more challenging. In the battle, your heroes attack enemies automatically; you just have to take care of few things; targetting, tactic cards, formation, and combat power. Let’s start the Returners guide and after it, check out our Returners cheats, tips & strategy. Tank type class includes characters having high HP. Fighter and Ranger class includes characters who are best in dealing physical damage. Mage and Support class characters have good MAG ATK, MAG DEF stats. How to get new characters? After the tutorial, you have 5 characters. If you want more, you can summon heroes using bluestones and coins. Just go to shop -> hero tab -> summon. Don’t waste your in-game currency on summoning low-quality heroes. Another 3-star hero on Day-7(As an attendance reward). Just play the game daily and get these rewards. In Returners game, you can select up to 5 characters for the battle. You can set up different character combination for different game modes. For instance; a different combination for adventure mode and a different set of characters for PvP or Proving Ground/Arena mode. On the main screen, tap on the team tab(at the bottom-left corner) and there you can see the teams; league, adventure. To edit, at the right side, tap on the team option. Now, choose the characters according to their stats; power, skill, stars. At the beginning of the game, most of the game modes are locked in Returners. You have to rank up to unlock these modes. Just complete the chapters in adventure mode and you are good to go. Character level-up -> To level-up a character, you need EXP, can be obtained by getting victories in the battles; only those characters will get EXP who are in your team. Additionally, you can use EXP book(obtain it by completing quests, from the dungeon, as a reward) to level-up. When a character reaches its maximum level, you can use transcend feature. Transcending adds a star to that character. For instance; you have three-star character. Level-up that character to its maximum level and you will be able to transcend and this will make it a 5-star character. 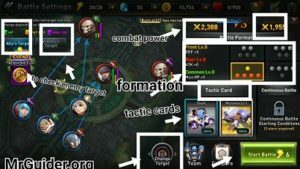 How to collect tactic cards? It’s very easy; complete the chapters and open the rewarded chests, complete the quests, as a reward, battle in other game modes. Before you start the battle, tap on an empty slot to add a tactic card. At the beginning of the game; you have taunt and recovery card; they are also best. So, this is the Returners guide. 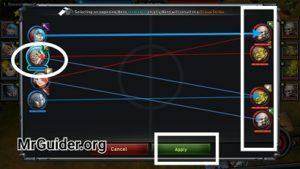 Let’s learn about battle strategy, cheats, tips. It could be better if you take part in events, complete all the quests, and play in all types of game modes. In short, build the best team as fast as you can; 1-star characters are useless; don’t focus on them. To equip a gear, go to the team -> tap on a hero -> auto-equip and that’s it. Enhance gears to increase gear status and upgrade gears to increase overall performance. Best way to level-up -> Play in adventure mode and repeat chapters. Get victories in those battles and obtain EXP. How to get high-quality gears? Complete the quests and get the chest. These chests include high-quality gear. Tap on Yuria icon and there you can check the quests. You can claim “free gear draw” after every 24-hours. Go to the shop -> gear -> free draw -> claim your gears. You start the game from the bronze league. Tap on the proving ground option and battle in this mode. Complete all the battles and get victories; you can earn decent rewards. Jump to high-league to get better rewards. On the main screen, at top-left, tap on the event shop option. There you can obtain precious items such as EXP Book, scroll, soul choice, 4-star tickets, 5-star tickets in exchange for event coins. 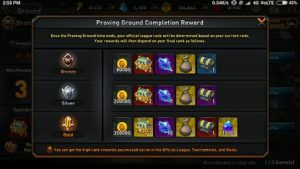 How to earn event coins? Just play the game; adventure mode, dungeon, proving ground/arena/league. If your combat power is low, then increase it by increasing the power of your characters. To target a specific enemy; first tap on your hero and then select enemy. Use tactic cards at the right time.